Subscribe and publish pattern is a messaging pattern in which subscribers register for a specific event to be dispatched from a publisher. The subscriber and publisher don’t have any relation or communication between them. Usually, this relation should be coupled between these parties. However, to be able to send events to the correct responder, there is a middleman, an event bus, in between publisher and subscriber as it is seen on Figure 1. Publisher posts an event to the bus and then bus delivers this event to the registered subscribers. EventBus is an android library which lets you use the subscribe/publish pattern easily. EventBus is on the Maven Central repository which means you can just add it to your gradle build file. Events are the messages that you want to send from your publisher and then receive it from your subscriber. They are literally POJOs and nothing special. To be able to receive an event you have to subscribe to that event. To do that, add @Subscribe annotation to one of your methods in your class. Setting threadMode in Subscribe annotation is optional. You can post an event from a background task like asynctask or any thread, and then you can receive it in main(ui) thread. Normally when your activity is suspended or paused, then your activity will not receive and event. Actually this is the promise of the event bus. However, you would have want to see the result of that long network request when you resume your activity(or recreated activity). When there are more than one subscriber(receiver) for an event, it will be convenient to receive the event according to priorities of the registered subscribers. As you can notice from the previous examples, all of the configurations are made in annotations. However, Greenrobot’s EventBus is not using reflection to process this annotations. Mainly beacase in Android, Java reflection is a performance problem and its not recommended. EventBus uses compile time annotation processing to index the subscribers. One of the main problems in an Android development is to decide and implement the communication between fragments and their host activities. In dark ages, you could have created an interface and then implement it in your activity. And then when you need to call some methods in your activity from your fragment, you can do that by this unproductive way. By using an event bus, you just post your event from the fragment and you now the activity will receive it without doing anything else on your part. In an Android service, that can perform long running tasks in the background without any user interface, you could potentially broadcast and intent to your Activity and you could receive and intent by extending IntentService in your Service. Or you could implement Bound Services, and messengers as described in android developer guides. Isn’t it easier to just post and event that you want to receive on the other hand without handling that boilerplate implementations? We can use EventBus here to ease the communication between out Services and any other components. You will have events for everything therefore it can be considered redundant to have that much messaging classes. Whenever your project becomes too complex, you have to find your subscriber in a convenient way like searching in class/project. If you start your background services in a different “process” then there is no way to communicate by using an event bus. Because your activities and your service are not in the same process and cannot interact with each other. However, it is not a common scenario. Square’s Otto library is a direct alternative to Greenrobot’s EventBus. However, it is deprecated at version 1.3.8 in favor of RxJava and RxAndroid. If you are into reactive programming then you can implement your own event bus by using RxJava. On the other hand there is no library for RxBus, however, its implementation is easy and you could implement the event bus in reactive way on your own. You can find an example implementation RxBus implementation here. In conclusion, EventBus is a great addition to your android arsenal. It can ease the comminication between activities, fragments, dialogs, services, asynctasks, etc. 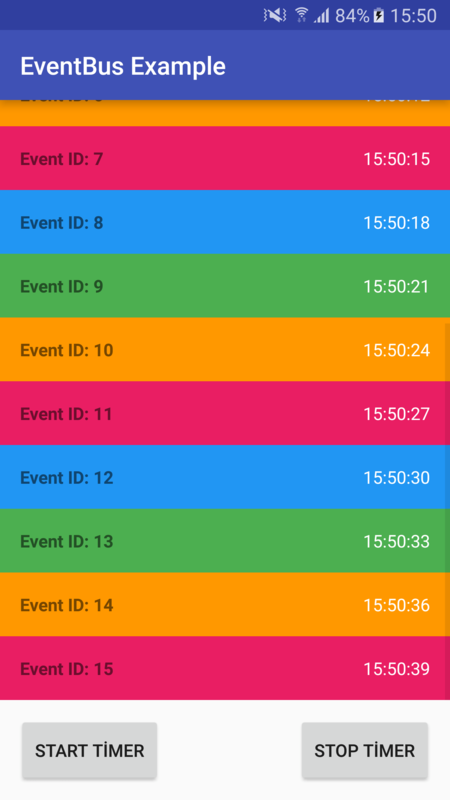 I highly recommend using EventBus in your android project. Once you get used to using events in your app -it doesn’t take much time- then you will be more “productive” when you develop your android application. Just be careful about drawback and pitfalls. You can check out the example project about the topics which I covered in this post on Github. In this example project, you can find a background service which is started on button click and it starts a timer which sends events. And the “MainActivity” receives this “SimpleEvent”. Also activity is talking to the service by using events as well. Thanks for reading. I would greatly appreciate if you share it.